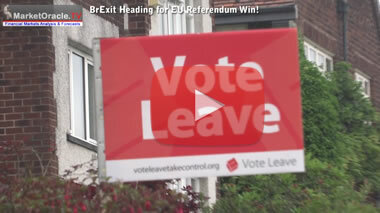 Britain's vote to LEAVE the European Union triggered immediate financial markets panic that prompted the Bank of England to implement its emergency market rescue plan that included making upto £250 billion available to Britains banks that succeeded in halting the BrExit financial panic in its tracks as sterling stabilised at lower levels whilst the FTSE soared into the stratosphere recovering all of Fridays plunge and registering its best weekly gain in over 4 years. 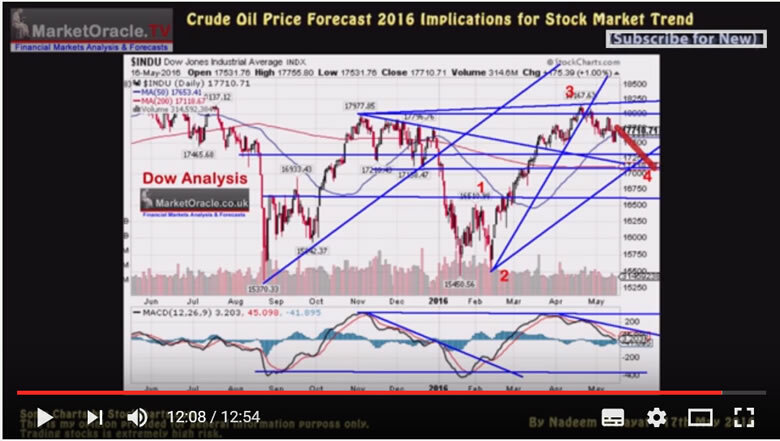 So what's next for the financial markets? Is the BrExit financial storm over? 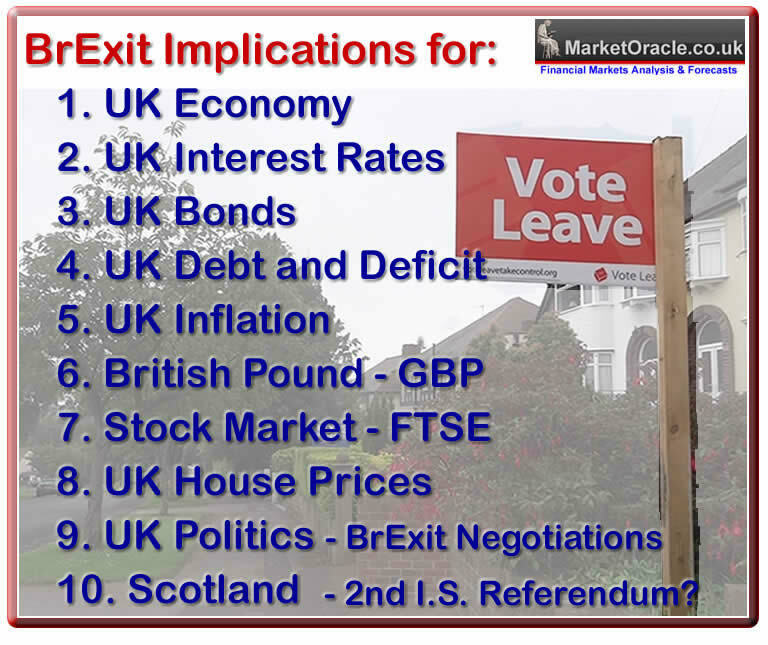 Find out in Part 2 of the Implications of BrExit on the financial markets, stocks, sterling, house prices and UK politics. The mainstream press is in a state of hysteria, panic even following the plunge in the British Pounds from a Thursday night high of £/$1.50 to currently stand at £/$ 1.33. Whilst yes the 12% downwards plunge from £/$1.50 is in forex markets terms HUGE, a move not seen the likes of for many decades that takes the dollar exchange rate down to levels last seen in 1985. Nevertheless the mainstream press has missed one fundamental fact for the obvious reason that they just DO NOT understand the financial markets and what the market movements actually mean or translate into. This despite the same clueless press earlier on in the year reporting on the likes of Japan implementing NEGATIVE interest rates in an attempt to PUSH the Japanese Yen LOWER as each nation in an attempt to boost domestic demand by means of importing inflation and exporting deflation in what is commonly termed as the CURRENCY WARS. Therefore rather than the plunge in the British Pound being disastrous, instead Britain has effectively won a regional war in a raging global currency war all without implementing any panic monetary tools or economic policy, which is set against other central banks right across the western world from Switzerland to the whole Euro-zone block and Japan, repeatedly cutting their interest rates to below ZERO in panic attempts to push their currencies LOWER! With the sterling plunging towards 1.30 the 1.40-1.50 range may now seem very distant but I think that when the dust settles a year from now sterling should be back in to its pre-Brexit trading range against the US Dollar as the forex markets turn their attentions to the EURO! And a reminder that a weak currency is the objective of EVERY central bank in what has been termed as currency wars, the most notable manifestations of which are zero and NEGATIVE interest rates, Japan, the European Union, China and the United States ALL WANT a WEAK currencies so that they can export deflation and import inflation. So Britain's currency plunging boosts exports and cuts imports which means Britain has effectively won a major battle in the currency wars without implementing any extreme market measures such as the likes of BoJ, ECB and Swiss central banks have this year! So what did the FTSE actually do? Well, the FTSE futures bottomed early Friday morning at about 5750, before the markets opened, and then with each passing trading day have gathered strength and momentum to the UPSIDE! With the last FTSE close of 6577, its highest since August 2015 and apparently having had its best week in over 4 years! So what happened to the brexit stock market apocalypse? Take note dear reader of the garbage that is 90% of that which passes for market commentary, written by clueless journalists, academics or salesmen. So against prevailing year long perma-doom my consistent view ALL year has been that the stock market would trend towards NEW ALL TIME HIGHS before the end of this year. Whilst my last in-depth analysis of Mid May concluded that stocks had entered a correction that would see the Dow trend lower towards 17,000 by the end of June 2016, just as that which has subsequently come to pass and now resolved in a trend that should take the Dow to new all time highs. Therefore, so far the stock market has been trending inline with my expectations i.e. to temporarily plunge on Brexit, and now having recovered ALL of the decline and more, so has done nothing to alter my long standing view that the stock market remains on track to trend towards new all time highs during the second half of this year as the above video of Mid May illustrates, and which I will come back to in great detail in forthcoming analysis but for now take this as another warning not to listen to the perma doom near always wrong crowd who today are once more busy peddling crash, collapse, and worst bear market in history fear, that if they actually acted on their calls would now also be going broke! This whilst the likes of the FTSE clearly remains firmly within its trading range which for a bull market tends to be a precursor for breakout to new highs, as has been the case for over 7 years now and which is the message I have iterated for the duration of this stocks bull market. 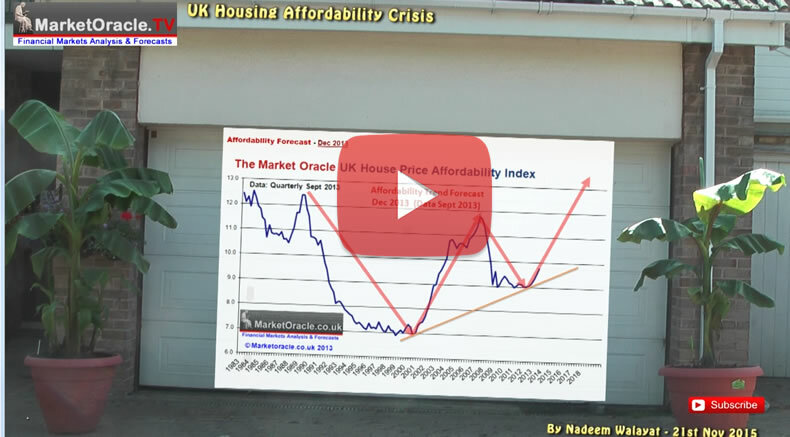 Whilst London will see a more severe slowdown in momentum than the rest of the UK and actual year on year falls in some over priced locations and for flats, as per my in-depth analysis of December 2015 that had expected London to take a hit but overall UK average house prices to continue trending higher for 2016, a trend that should become apparent over the coming months. David Cameron's announcement to step down as Prime Minister by early September propelled Brexit Leader Boris Johnson to become the favourite to takeover as Britain's next Tory Leader and Prime Minister. However, the great game for the Tory 'iron throne' was on, as Michael Gove today both discredited Boris Johnson whom he was supposed to be the campaign manager for and then went against EVERYTHING he has stated during the EU Referendum Campaign, in fact against everything he has been saying for the past 4 years by declaring that he himself would now stand for the Tory Leadership, so it looks like Gove, just like 'Little Finger' has apparently been manoeuvring towards the Tory 'iron throne' all along! For instance during the referendum campaign when asked in one of the debates - "When Mr Cameron steps down are you considering a leadership bid?" Michael 'Little Finger' Gove replied " I can tell, I am absolutely not. The one thing I can tell you is that there are lots of talented people who could be Prime Minister after David Cameron, but count me out"
And earlier still ""The one thing I do know having seen David Cameron up close is it takes extraordinary reserves of patience of judgement of character to lead this country and he has it and I don't and I think it's important to recognise in life you’ve reached an appropriate point." And one more time - "There are lots of other folk including in the Cabinet who could easily be prime minister, I am not one of them. I could not be prime minister, I am not equipped to be prime minister, I don’t want to be prime minister." 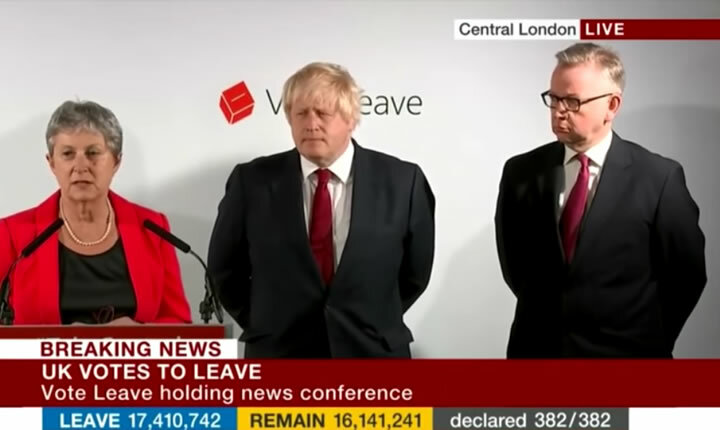 "I have come, reluctantly, to the conclusion that Boris cannot provide the leadership or build the team for the task ahead. I have therefore decided to put my name forward for the leadership." In response to which Boris Johnson surprised all by stating that he would not be standing - "I must tell you my friends, you who have waited patiently for the punch line of this speech that having consulted colleagues and in view of the circumstances in Parliament I have concluded that person cannot be me, my role will be to give every possible support to the next Conservative administration to properly fulfill the mandate if the British people"
So whilst Michael 'Little Finger' Gove may today be the rank outsider amongst the list of declared candidates to sit on the Tory 'iron throne' now that Boris 'Baratheon' Johnson has been slain along with his bullingdon club buddy David 'Lanister' Cameron, which effectively clears the field for previously unthinkable candidates such as Michael 'Little Finger' Gove to continue working his way on the Tory 'iron throne'. It's too early to see who will win the chaotic great game to become the next Tory Leader and Prime Minister as there is a long way to go and with much more political bloodshed expected along the way, but for now do NOT underestimate Michael 'little finger' Gove. And whilst the Tories sort out their next Leader Britain is effectively being run by Mark Carney at the Bank of England who has been busy pumping hundreds of billions into the markets and banking sector. Meantime the Labour party seeing the Tories in complete disarray have decided to go one step better by completely self destructing as Labour MP's attempt to get rid of Jeremy Corbyn, who is the overwhelming choice of the ordinary Labour party members, an effective Westminister coup which does not bode well for Labours electoral prospects. In fact we may be seeing the death of the Labour party as we have know it splitting into god knows what factions. After all Labour is already dead in Scotland and has been dealt a hammer blow in North England and Wales with UKIP turning its core heartlands into hollow husks as illustrated by the results out of the supposed Labour strong holds of Sheffield (52% Leave) and Rotherham (67% Leave) as Labour is morphing into a party just of London, completely detached from its traditional supporters across England, this changing the Leader is not going to make any difference to the crisis Labour faces! All of which acts to reinforce my long standing expectations that the Conservatives remain firmly on track to win the NEXT General Election regardless of who eventually claims the Tory 'iron throne' because the opposition is disintegrating before our very eyes. And where BrExit is concerned, it is useful to know that whilst 52% of the British people voted for LEAVE, 75% of Westminister MP's backed REMAIN, which means it is going to be tough to achieve a BrExit outcome, especially if the next PM is not selected from the BrExit camp. And this throws up an even bigger problem for Westminster which is that the mainstream political parties DO NOT reflect the electorate. The divisions between the three centrists parties - Labour, Liberals and Conservatives does not reflect the real world divisions in the country which the EU Referendum highlighted , i.e. LEAVE and REMAIN were better representative entities than either of the Conservative or Labour party's, which implies that the referendum may claim at least one of these parties (Labour most probable) as the political spectrum is redrawn. "Okay, it's clear there was a vote to leave, but it wasn't 70-30 or 60-40, it was 52-48. Yes the referendum expressed the will of the people but the will of the people is entitled to change." Tony Blair is apparently forgetting that his own Labour election victories never achieved anywhere near 52% of the vote, with his last election win on barely 35%, but now apparently he wants to subvert the clear will of the people far beyond that which any government has achieved since before the second world war!. And finally we come to Scotland, shrill voices heard from north of the wall as the likes of the SNP are seeking to subvert the will of the British People with threats of their own second Independence referendum. However, IF that happens I am sure Scotland will once AGAIN vote to REMAIN within the United Kingdom because by the time the referendum is held, say 2 years from now, then it will become crystal clear that EXITING the European Union WAS INDEPENDENCE not just for the UK but also for Scotland. BrExit really is in the BEST interests of ALL of the people of Britain, even those that support the SNP fundamentalist fanatics who in their hatred of all things England would rather see Scotland burn then remain within the United Kingdom, which includes being members of a dieing European Union that in my long standing opinion is heading for disintegration of which BrExit is just the most recent step along its ultimate path towards collapse. So whilst the likes of Sturgeon fantasises that the European Union will welcome breakaway Scotland with open arms, however, virtually every EU nation has their own Scotland, each seeking independence from their nation states and thus the EU giving Scotland 'special treatment' would rejuvenate secessionist movements right across the EU with the likes of Catalonia and the Basque region in Spain, Venice and Tyrol in Italy, Corsica in France, Flanders in Belgium and even Bavaria in Germany are just some of Europe's many independence flash points which means few EU nations will be willing to open up that can of worms. And then we have the economic reality of Scotland that is on the receiving end of a net subsidy from England of £11 billion. So if Scotland leaves the UK are the SNP fantasising that the bill for filling the £11 billion black hole will be picked up by the likes of Germany? And what happens when Scotland fails to realise its annual net subsidy of £11 billion from the European Union? Scotland will within a matter of months if not weeks become Greece 2.0. So does Sturgeon really think that with all the chaos Greece has wrought on the Euro-zone that the EU wants to repeat the same mistake with Scotland i.e. to replace the UK which is a net contributor to the tune of about £10 billion per annum with one that demands a net subsidy of £11 billion per annum? A reminder that Scotland's break even oil price i.e. one where Scotland could finance what it spends without subsidy is $150. So where is the price today? $48, which isn't enough to keep Scotland's oil sector alive without additional English subsidies let alone cover the Scottish governments £11 billion black hole! An Independent Scotland as part of the Euro-zone would be the same bankrupt sinking ship as is Greece, in permanent recession, where the voice of 5.3 million Scots would count for little amidst a pool of 450 million europeans (after brexit). And that is before we come to the details that would once more crop up during a second referendum campaign, the details of currency, debt, subsidy, oil fields and more. All of which led the people of Scotland last time to vote to REMAIN within the UK. So this is where I stand in the immediate aftermath of Brexit on 10 key economic indicators and markets, that I will each come back to as I map out in detail the prospects for Britain and Europe over the coming months and years so do ensure you are subscribed to my always free newsletter to get this analysis in your email in box.